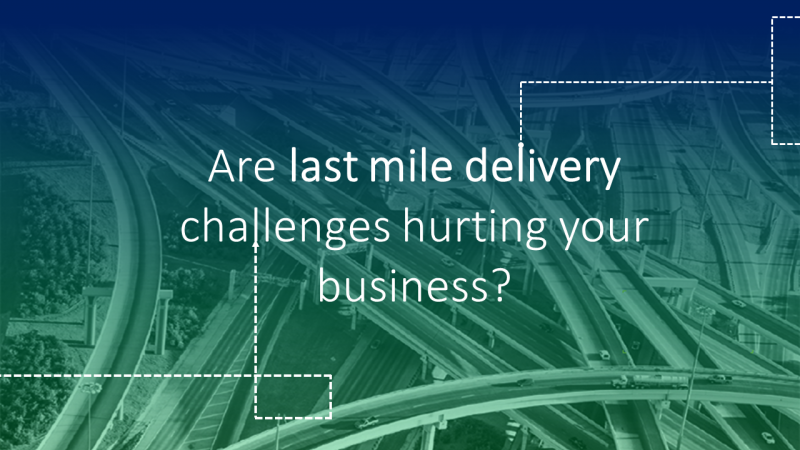 HomeBlogAre Last Mile Delivery challenges hurting your Business? There is a sense of satisfaction in clicking to confirm an order and receiving it on time. Since every purchase made online is a hard-won, shipping accuracy has become a critical part of the buying experience for shoppers. We all know how it affects our relationship with the customer and goes on to form a long-term bond. Consumers do not forget this type of experience easily, and they do not hold back to mention any positives or negatives to their friends and family. Any delivery service – whether to home, store or pick-up location – has become a clear point of differentiation, so a positive brand experience is needed at every step of the delivery cycle. It is important to address the challenges in the delivery with a sense of urgency, as bad experience has a direct impact on the consumer relationship with the brand. 1. Delays in delivery: Delay in receiving of the order creates frustration and dissatisfaction in the customer. Customer’s expectations for a no-nonsense delivery are absolutely very high. There may be many reasons for delays in delivery such as incorrectly filled order form, package redirection, the delay caused by customs, difficult access to the property, unclear writing due to bad print quality, weather conditions and potentially, other temporary technical issues. It’s important to prepare in advance for potentially delay-causing factors and find solutions for the same. The pre-delivery inspection must be a part of SOP so that product is shipped without any damages to avoid a bad experience for the customer. Since you can’t do anything about the weather, either you make alternate arrangements or must convey to the customer the exact delivery date. 2. Returned merchandise: The product is delivered but the customer doesn’t like it, now the real problem is handling the product being returned/exchanged. Perhaps the item wasn’t what they expected, or the color or dimensions were off. Regardless, the customer doesn’t want a bad return experience and you don’t want an unrecoverable loss. For this, you must put in place the technology and manpower to improve the ease of returning an order immediately. As soon as you get the return request, make sure the shipment reaches the fulfillment center/delivery hub faster so that it is ready to be sold again. Also, the timely credit or refund will enable the customer to make a new purchase in exchange for the returned order. 3. Delivery Uncertainty: The inability to see if or when a delivery has been scheduled and where it is in the delivery process hampers your chances of providing a seamless delivery experience. Modern customers want the control in online shopping too. They want to see it happening on their mobile screens with a single tap. For these real-time updates, you need to have latest delivery tracking systems at your disposal which act as an interface between you and your customer. 4. Scheduling Deliveries: The order volumes have grown and so has the nature of deliveries to be made. Sometimes, the customer is not at home/office where the delivery was supposed to be done. This causes multiple attempts for the delivery and increases logistics costs. Not to forget, this can act as a spoiler for the customer, so in such cases, you must act smartly and proactively. Incorporate checklist while processing an order for standard checks such as – making sure the system is populating alerts for the customers so that they are well-informed all the time; before the order is out for final delivery, checking whether the customer is at the shipping address or not through a phone call etc. This ensures delivery happens at the right time and right place. With the e-commerce tipped to grow multiple times, it is the last mile delivery which will attract customer’s attention the most. This is where online will meet offline. Businesses must find ways to provide smooth experience during the “last mile”. For this, they need to strengthen their supply chain and adopt technology, expertise and latest methodology to provide best-in-class delivery experience.